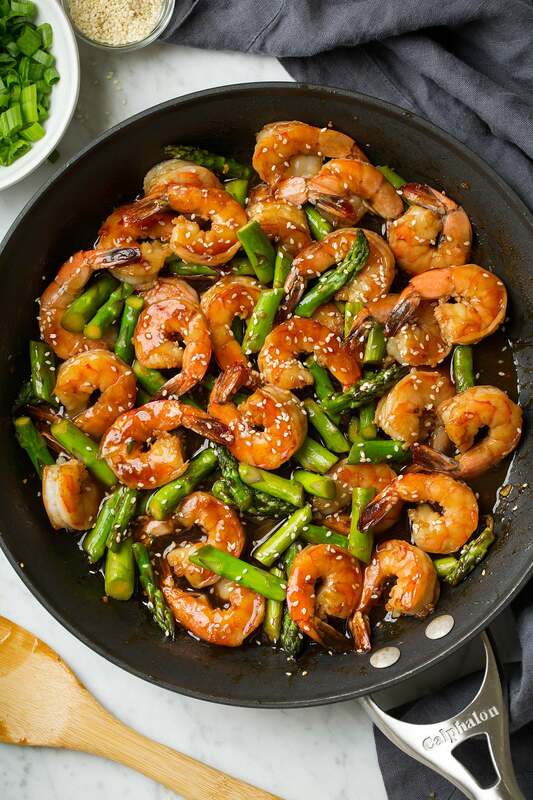 Teriyaki Shrimp and Asparagus is a simple yet perfectly flavorful dinner that is sure to please. Tender pieces of shrimp are coated with a sweet and tangy sauce that will leave you craving more! 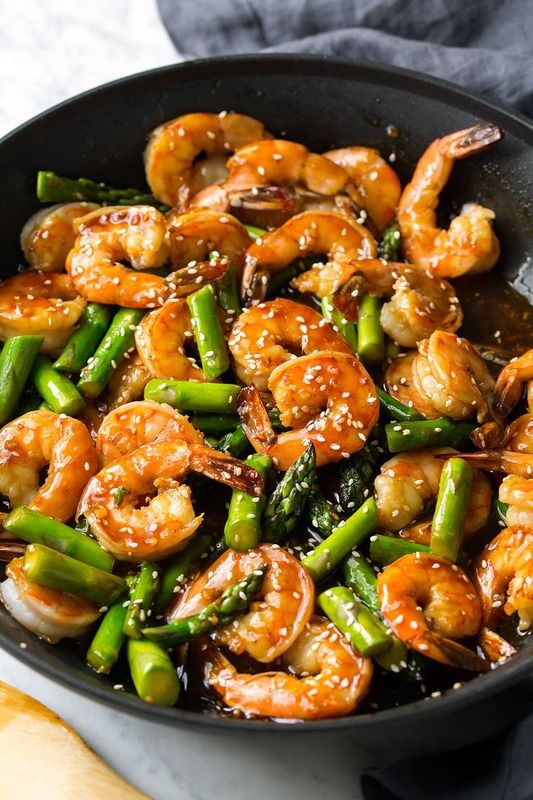 You know I love that teriyaki sauce, but it wasn’t until now that I tried it with shrimp and I’m hooked! The flavors all just blend so well, and when served with brown or white rice it’s a perfectly hearty and satisfying meal. I’m so glad that the majority of my family has come around to loving shrimp because I’m a full fledge shrimp fan now. Five years ago, I never would have thought I’d be making teriyaki shrimp for dinner, but here I am making it for dinner allll of the time. What took me so long? I was definitely missing out, not only on the tastiness of shrimp but that three-minute cook time for shrimp. You just can’t beat that. And when it’s covered generously in a sweet, salty and tangy homemade teriyaki sauce then sprinkled with those little crunchy flecks of sesame seeds and paired with perfectly crisp-tender asparagus like so, you know it’s going to be straight up delicious! This is how you do weeknight dinners! In a saucepan whisk soy sauce, 5 Tbsp water, honey, brown sugar, ginger, garlic and rice vinegar. Bring to a light boil. Whisk together cornstarch with remaining 1 Tbsp water, then add to saucepan. Boil 1 minute while stirring. Saute asparagus in skillet until tender, transfer to plate. Cook shrimp in skillet about 3 minutes, turning once. Add in asparagus, pour in teriyaki sauce and toss everything to evenly coat. Can I Substitute Another Vegetable? This would also be delicious with broccoli in place of the asparagus (you’ll just need a little more oil when sautéing), I’ll be trying that out next. Snow peas would be another great choice, as would bell peppers and matchstick carrots. 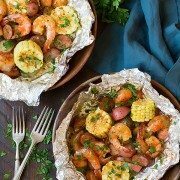 Do I Use Raw or Pre-Cooked Shrimp for This Recipe? You want to use raw, fresh shrimp in this recipe. If you use the pre-cooked frozen shrimp that comes in bags, you’ll wind up cooking the shrimp twice and the texture of this dish will be off. Trim the ends of the asparagus before adding it to the skillet. The ends are quite woody and don’t taste good! 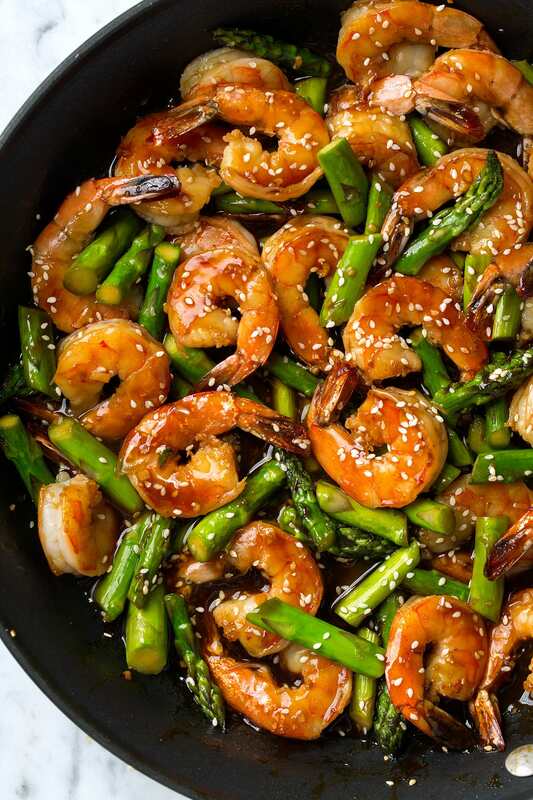 Fresh ginger is key in this simple teriyaki shrimp and asparagus stir-fry. If possible, avoided powdered ginger for the best flavor. Watch the shrimp carefully while it cooks. You’ll know it’s ready to eat when it turns a bright pink color. 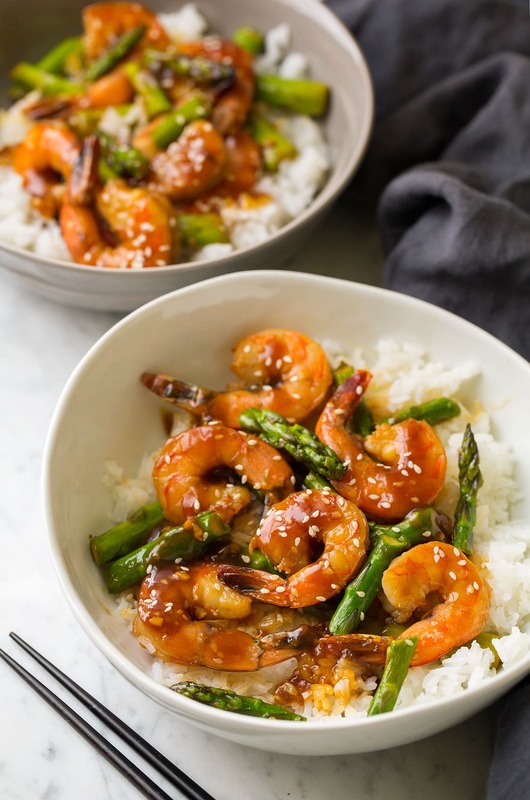 This is a simple yet perfectly flavorful shrimp recipe that is sure to please. Tender pieces of shrimp are coated with a sweet and tangy sauce that will leave you craving more! In a small saucepan whisk together low-sodium soy sauce, 6 Tbsp of the water, honey, brown sugar, ginger, garlic and rice vinegar. Bring mixture to a light boil over medium-high heat. Whisk together cornstarch with remaining 1 Tbsp water, then add to sauce mixture in saucepan. Reduce heat slightly and allow to boil 30 seconds - 1 minute, stirring constantly. Remove from heat, cover and set aside. Heat 1 Tbsp oil in a 12-inch non-stick skillet over medium-high heat. Add asparagus and saute until tender, about 4 - 5 minutes. Transfer to a plate. Heat remaining 1 Tbsp oil in skillet, add shrimp. Cook on first side about 1 1/2 minutes then flip and cook on opposite side until cooked through, about 1 1/2 minutes. Add in asparagus, pour in teriyaki sauce and toss everything to evenly coat. Serve warm over white or brown rice, garnish with sesame seeds if desired. You'll know the shrimp is ready to eat when it turns a bright pink color. Maryse: Hi, this looks delicious! Actually, everything you post look delicious!!!! And the pictures are gorgeous!!! 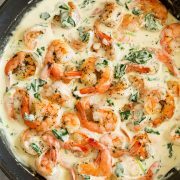 I was wandering, is the recipe done with raw or cooked shrimps? Paige Flamm: This looks amazing! 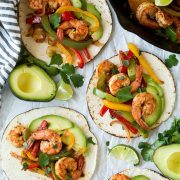 Definitely making this with the leftover shrimp in our freezer!